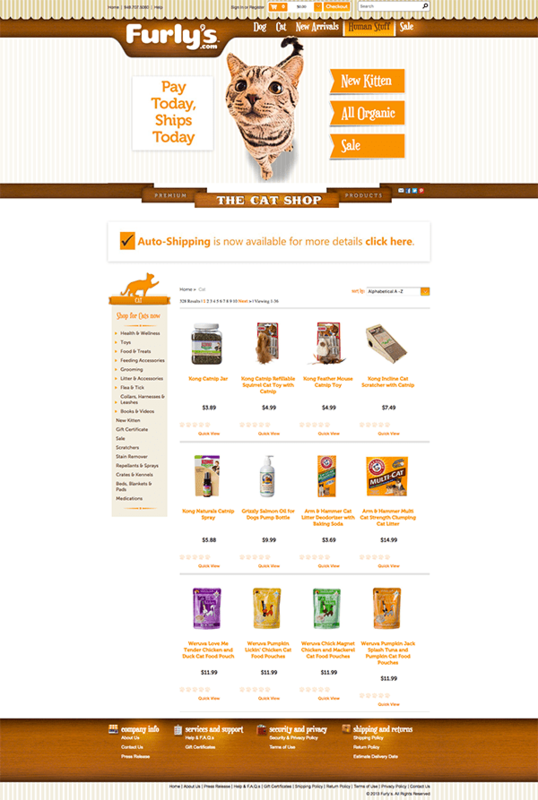 The Furly’s website case study describes some of the design and development considerations for an ecommerce website for a local pet supply store. Furly’s started selling via eBay and Amazon but quickly moved into their own brick and mortar and wanted a website to be able to sell some of their inventory online. Building and designing an ecommerce store involves a lot of moving parts, inventory tracking, customer info storage, checkout process, shipping and payment method setup and most importantly product for sale, their photos and description of each item. We specialize in using platforms that make it easy for the owner of the site to maintain their inventory and sell online. We placed each product under a specific category. Each can be quick viewed from the category page or viewed from the individual page. To easily view a products can be viewed in more detail by hovering over them. Products with options, such as color or size have drop downs to indicate choices. Some products, such as dogs tags, have customization to allow customers to enter the text for the tag. Under the hood each product has markup that helps with Search Engine Optimization (SEO). Just like Amazon and larger pet supply chains, Furly’s wanted to offer auto-shipping. This was implemented using custom coding and recurring billing/auto shipping was added to the checkout process. created by the store from within the cart page. Items can also be deleted or quantities adjusted. Customers can also purchase gift certificates and pay with credit card or balances in their accounts. Customers have a saved order history if they purchase while signed in. Guest checkout is also an option for completing the checkout process. From start to finish, Stacey provides accurate, efficient, and professional work. Her experience and knowledge sets her apart from the competition and her pricing is very reasonable.